Inlays can be used to replace large fillings and especially amalgam fillings. An inlay restoration is a custom made filling made of gold, or tooth-colored porcelain. It is made by a professional dental laboratory and is permanently cemented into the tooth. Inlays can be utilized to conservatively repair teeth that have large defective fillings or have been damaged by decay or trauma. Inlays are an ideal alternative to conventional amalgam and composite fillings. 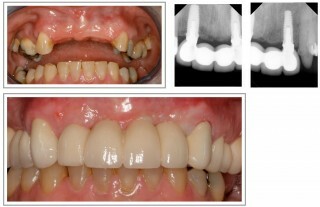 Inlays are more conservative than crowns because less tooth structure is removed in the preparation of inlays. An inlay procedure usually requires two appointments. Your first appointment will include the preparation of the tooth and taking of an accurate impression that will be used to fabricate the inlay. While the tooth is numb, Dr Doman will remove any decay and/or old filling materials. The space will then be thoroughly cleaned and carefully prepared, shaping the surface to properly fit an inlay restoration. A temporary filling will be placed to protect the tooth while your inlay is made by a dental laboratory. An onlay restoration is a custom made filling made of gold, or tooth-colored porcelain. Porcelain onlays are made by a professional dental laboratory and are permanently cemented onto the tooth by your Dr Doman. Onlays can be utilized to conservatively repair teeth that have large defective fillings or have been damaged by decay or trauma. Onlays are sometimes an ideal alternative to crowns because less tooth structure is removed in the preparation of onlays. Onlays are essentially identical to inlays with the exception that one or more of the chewing cusps have also been affected and need to be included in the restoration. A crown is a laboratory-constructed restoration, which covers all or part of a tooth in order to restore both appearance and function. The purpose of a dental crown is to encase a tooth with a custom-designed material. Crowns are indicated for teeth with very large fillings, teeth that have had a root canal treatment, fractured teeth and misshapen and/or discolored teeth. We offer conventional metal ceramic crowns as well as non-metal based, all-ceramic crowns. A crown protects and strengthens tooth structure that cannot be restored with fillings or othertypes of restorations like inlays or onlays. Although there are several types of crowns, full porcelain crowns are the most popular. They are highly durable and will last many years, but like most dental restorations, they may eventually need to be replaced. A crown procedure usually requires two appointments. Your first appointment will include taking impressions that will be used to fabricate the crown. A temporary crown is manufactured which will stay on your tooth for approximately two weeks until your new crown is fabricated by a dental laboratory. While the tooth is numb, Dr Doman will prepare the tooth by removing any decay and shaping the surface to properly fit the crown. Once these details are accomplished, your temporary crown will be placed with temporary cement and your bite will be checked to ensure you are biting properly. Dental bridges are used to replace missing teeth. A dental bridge is a fixed (non-removable) appliance and is an excellent way to replace missing teeth. A bridge can either be tooth-supported or implant supported and is often used as a replacement for a removable partial denture. There are several types of bridges. Dr Doman will discuss the best options for your particular case. The traditional bridge is the most popular type and is usually made of porcelain fused to metal. This type of bridge consists to two crowns that go over two anchoring teeth(abutment teeth) and are attached to pontics (artificial teeth), filling the gap created by one or more missing teeth. • Prevent remaining teeth from drifting out of position. • Restore chewing and speaking ability. Next, a highly accurate impression is made which will be sent to a dental laboratory where the bridge will be fabricated. In addition, a temporary bridge will be made and worn for ± 2 weeks until your next appointment. When a tooth or teeth are missing, they can be restored by placing crowns on the teeth next to the gap onto which false teeth are fixed. A bridge is cemented in place and cannot be removed by the patient. Bridges can be constructed from metal, porcelain, or a combination of the two. Dental implants can support more than one tooth unit. In this case, the bridge is either cemented or screwed to the implants below. The number of implants needed to support the bridge depends on many factors. There are always many alternatives to restore a missing tooth or teeth. Implants are frequently used as an alternative to bridges to avoid tooth preparation. The advantages and disadvantages of the different options are explained to our patients as part of the treatment planning process.